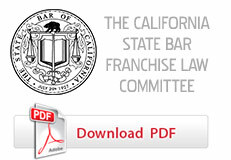 Recent Case Demonstrates Importance Behind Properly Educating Courts On California’s Franchise Laws. Franchise and Distribution Law is one of a handful of legal specialties certified by the California State Bar. Franchising is recognized as a specialty largely in part to the complexities and nuances within state and federal franchise laws – most notably, California’s Franchise Investment Law and Franchise Relations Act. Notwithstanding this recognized area of legal specialization, lawyers less familiar with franchising are still retained to litigate disputes arising out of franchise or quasi-franchise relationships. Too often, this lack of familiarity results in misapplication of the law and unfavorable outcomes for their clients. A recent California District Court decision in the case of Estep v. Yung, 2015 U.S. Dist. LEXIS 4475 (E.D. Cal. Jan. 14, 2015), illustrates the importance of qualified franchise counsel to the outcome of a case. As discussed below, the parties’ failure to properly educate the Estep court on California’s franchise laws resulted in a flawed application of the law and adverse outcome for the subfranchisor. The relevant factual background in this case is straightforward. Defendant HDYR, LLC (“HDYR”) is a Texas-based franchisor of the fast-casual, custom sushi restaurant concept “How Do You Roll?” There are currently twelve How Do You Roll? locations spread across six states – none of which are located in Northern California. In June 2012, HDYR registered to sell franchises in California. The following year, HDYR entered into an Area Representative Service Agreement (the “AR Agreement”) with Mekadishkem-EBE, Corp. – a company owned and operated by Plaintiffs David and Deanna Estep. In exchange for a payment of $60,000, Plaintiffs’ company was granted the exclusive right to solicit qualified prospective franchisees in a territory comprising much of Northern California, and to develop, support, and provide services to any franchisees in that territory. After being served with the lawsuit, Defendants timely removed the case to the District Court in the Eastern District of California on diversity grounds. Plaintiffs opposed the motion to transfer on several grounds, most notably, on the ground that the out-of-state forum selection clause is void and against California’s “broad” public policy codified in the California Franchise Relations Act (“CFRA”) at Business and Professions Code § 20040.5 (“Section 20040.5”). Relying upon this language, Plaintiffs argued that – although the AR Agreement is not a “franchise agreement” – the AR Agreement still falls within the protections set forth in Section 20040.5 because it relates to franchise agreements. At the onset of its analysis, the court explained that under Ninth Circuit law, contractual forum selection clauses are “presumptively valid” unless: (1) the clause was the result of fraud, undue influence, or overweening bargaining power, (2) the selected forum is so gravely difficult and inconvenient that Plaintiffs would essentially be denied their day in court, or (3) enforcement of the clause would contravene a strong public policy of the forum in which the suit was brought. Any franchise lawyer presented with this fact pattern is likely to scrutinize the court for “getting it wrong.” However, review of the parties’ briefs suggest that the blame should not fall to the court, but instead, to the parties for failing to properly educate the court on California’s franchise laws. In particular, the parties failed to enlighten the court on the statutory definitions of “franchise” and “subfranchise” – two definitions that cover the AR Agreement and likely would have resulted in a dramatically different decision by the court. Without going into any significant detail, the terms of the AR Agreement appear to satisfy each of the three prongs defining a “franchise” – i.e., Plaintiffs were granted the right to sell and provide support for How Do You Roll? franchise businesses under the direction of HDYR and in exchange for a fee of $60,000. Thus, the court should have found the AR Agreement to be a franchise under the franchise law. Under either definition – i.e., “franchise” or “subfranchise” – the AR Agreement constitutes a franchise agreement under the franchise laws. Instead of bringing these definitions to the court’s attention, Plaintiffs couched their argument entirely within the language of Section 20040.5, and Defendants’ papers did little more. These obvious mistakes by counsel led to the court’s erroneous finding that the AR Agreement is not a franchise agreement and, therefore, not protected by Section 20040.5. To be fair, lack of education alone may not have been the only factor influencing the court’s flawed ruling. Rather, the court’s order suggests that it also may have been influenced by questionable conduct by Plaintiffs’ counsel. The Court also found Plaintiffs to have “inexplicably sued their own company” as part of what appears to be a failed attempt to defeat diversity jurisdiction. Finally, the Court was not pleased with Plaintiffs’ argument that the motion to transfer was untimely – noting that the Plaintiffs had “completely ignore[d]” the timing requirements of Federal Rule of Civ. Proc., Rule 81. Notwithstanding the court’s evident frustration with Plaintiffs, the court would have been hard-pressed to grant the motion to transfer had the court been properly educated on the relvant franchise laws. Def.’s Mtn. to Transfer, Ex. A, ¶ 17.1 (October 21, 2014). Pl.’s Oppo., p. 1:15-19 (November 20, 2014). Def.’s Reply Brief, pp. 2:8-10, 5:1-3 (November 24, 2014) (emphasis added). Estep, 2015 U.S. Dist. LEXIS 4475, *3 (citing R.A. Argueta v. Banco Mexicano, S.A., 87 F.3d 320, 325 (9th Cir. 1996), and Nagrampa v. MailCoups, Inc., 469 F.3d 1257, 1284 (9th Cir. 2006) (“California favors contractual forum selection clauses so long as they are entered into freely and voluntarily, and enforcement would not be unreasonable.”). Estep, 2015 U.S. Dist. LEXIS 4475, *3 (emphasis added). Corp. Code § 31005(a); Bus. Prof. Code § 20001(a). Corp. Code § 31008-31010; Bus. Prof. Code §§ 20004-20006. Id., p. 4:16-19 (Defendants cited generally to the definitions of “franchisee” (“a person to whom a franchise is granted”), and “franchisor” (“a person who grants a franchise”) under Cal. Bus. & Prof. Code §§ 31006 and 31007 (erroneously referred to in the brief as § 31107)). Estep, 2015 U.S. Dist. LEXIS 4475, *2, fn 2. Id. at *2, fn 1.